If you like Spotify’s Discover Weekly music recommendations, you might enjoy the service’s latest update. Today, Spotify is rolling out Concerts, a new feature that recommends, well, just that. Based on your location and music taste, Spotify will surface live gigs that are happening nearby from your favorite artists (or artists it thinks you might like). If you plan to travel, you can also hit the Change Location button to get an updated list based on wherever you’ll be. The feature is powered by Songkick and you’ll need to go through the service to purchase tickets. 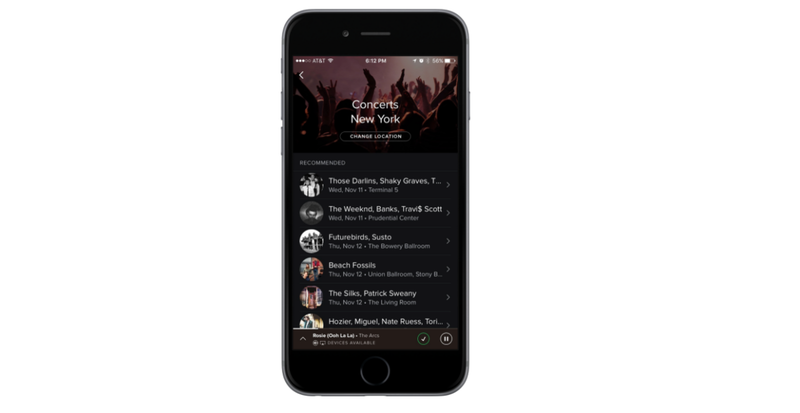 Spotify hopes that in addition to helping its users find shows nearby, it’ll also encourage artists to continue using Spotify as the platform to reach fans – old and new. Concerts is rolling out first to iOS and Android – an update for the Web app will hopefully follow.